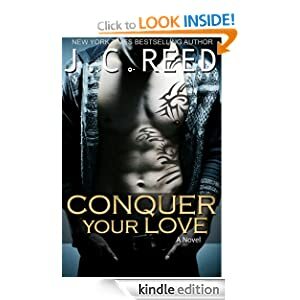 Surrender your love/Conquer your love J. C.Reed. I read the first book thinking it was a stand alone…and it wasn’t 😦 anyway now the “sequel” is out – so i bought it. Now to me Sequel is the last book, the one that continues from the first and ends the story. With me so far ? So book plus sequel = complete story, 3 books = complete trilogy etc but no- got to about 90% and it was clear that in fact there’s yet another book to follow!! that was the first I realised. There I was wondering when all was going to be revealed and …damn it there’s not time, so there ust be another book. Grrr. I’m getting really fed up of buying books and not being warned that they aren’t standalone, or that what i thought was last book isn’t (see my crossfire trilogy becomes series rant on my blog for more of That!) So i’m really disappointed in this book for that reason – i’ve still to wait for the end, i don’t know when its coming…or what it will cost, or even how many more books it will take. The book itself was good, but i had to go back and refresh my memory as to part one – i’ve so so many unfinished books like this its unreal, and i try not to buy until all parts are out. Its just not fair on readers to do this. In a conventional series – which i love, each story is more or less complete and the reader knows what to expect from outset. Books like this one though are deceiving and its just not good enough in my opinion. Come on authors – at least Tell Us its only part of the story. be honest with us. Tell us what the whole story will cost, how many books (and stick to it please) and when to expect them.